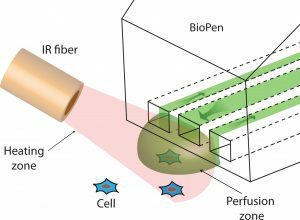 A novel approach for the study of single-cell intracellular enzyme activity at various temperatures was accomplished by using the BioPen (formerly Multifunctional pipette) in combination with a localized laser heating probe. A pore-forming agent α-hemolysin and an enzyme substrate fluorescein diphosphate (FDP) were delivered to individual cells by using the BioPen, to subsequently control the cell membrane permeability and target delivery of the FDP substrate. While adjusting the local temperature using a laser heating system, the activity of the enzyme alkaline phosphatase was monitored by following the production of the fluorescent product from the FDP substrate. The quantitative estimates for the intracellular alkaline phosphatase activity at 5 diﬀerent temperatures in diﬀerent cell lines were generated by constructing temperature-response curves of enzymatic activity at the single-cell level. Enzymatic activity was determined rapidly after cell permeation, generating ﬁve-point temperature-response curves within just 200 s.